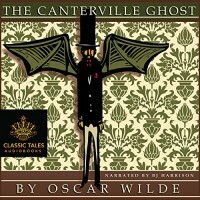 Sir Simon, the 300 year old resident ghost of Canterville Manor, takes his haunting very seriously. Over the centuries his terrifying spectral performances have sent more than a few Canterville descendants, visitors and servants off the deep-end, never to recover. All that changes when the current Lord Canterville sells the estate to American Minister Hiram B. Otis. Much to Sir Simon's dismay, the thoroughly modern and pragmatic American family that moves in is blithely indifferent to all his ghostly machinations. Fun ensues when the Otis boys turn the tables on Sir Simon and play their own pranks on the hapless ghost. But ultimately their kind and loving sister takes pity on poor Sir Simon and bravely helps him find the peace he so badly wants. I found this short story delightfully funny yet touching. It was my first Oscar Wilde work, and I was pleasantly surprised the prose wasn't overly formal and wordy like some 19th century writing. I laughed a lot and enjoyed all of Wilde's witty little jibs at American culture. The serious turn in the latter part of the tale was nicely done, and the poignancy of Sir Simon's desire to traverse the portals of death's house and be laid properly to rest was lovely and poetic. I definitely want to try more of Wilde's writing. I was also happy with B. J. Harrison's narration of this audiobook version. I liked his voice and interpretation of the story and characters. I did note a tiny glitch early on with a repeated word, and at times the consistency of his voice changes for a specific character faltered a wee bit. All in all, though, I'd recommend this audiobook version which was inexpensive and well worth the listen.